But which version of Cooper are the Seahawks going to see? The last time Cooper played the Seahawks was in London when he was still with Oakland. He didn’t last long — knocked out by Bradley McDougald. Carroll said Jerry Jones’ massive AT&T Stadium feels like a nightclub. Are Hawks capable of building a talented, consistent O-line? Pete Carroll has said he wants to create continuity on Seattle’s offensive line. 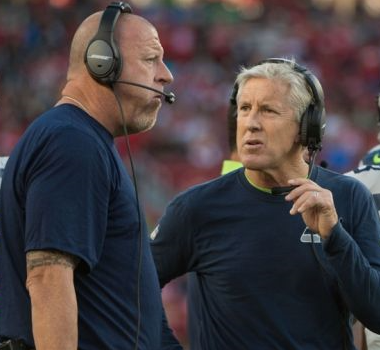 It’s debatable whether they have enough good guys yet, but the bigger question as pertains to Carroll’s stated goal: Will they ever be able to keep a quintet together in Tom Cable’s zone blocking system using their scattershot approach? Whether it’s bad drafting, a bad scheme or just bad luck, Carroll’s Seahawks have had terrible fortune on the offensive line — typically fielding one of the weaker units in the NFL and annually needing to overcome its deficiencies just to get to the playoffs. Why has it been so terrible? John Schneider and the coaches have consistently pointed to the disconnect between college and NFL offenses and the CBA-mandated lack of practice time. But every team faces those issues. For Seattle, it has been more than that. It has been a complete inability to field a healthy, consistent line — and a total failure to set up a line of succession. Justin Britt played a surprisingly good first game at center in Kansas City, earning the praise of Pete Carroll for how he handled Chiefs Pro Bowl defensive tackle Dontari Poe. It may have been Britt’s coming-of-age moment. And one of the keys apparently was the departure of J.R. Sweezy. While Carroll didn’t exactly say it that way, he told 710 ESPN that Britt has improved his technique and is no longer trying to be a brawler like Sweezy.